Sometimes the more you know, the worse off you are. However, this is just an example of how you can pick up a skin virus or infection without even knowing, and may not present itself for weeks. A similar incident occurred during a massage when the masseuse began to use a cactus bristle brush against my skin as part of her routine. The entire time I was concerned about the reuse of the tool, and was too polite to request that she not use it. I may be overthinking things, but this only comes to my attention because of what I see regularly in my practice of dermatology. I have many patients that have acquired warts from nail salons, the gym, and even from facials or waxing. Young women who come see me to treat tiny warts disseminated over the face or body commonly have a history of frequenting a spa or salons. When you are using instruments on patients and not properly sterilizing them, it can lead to the transmission of diseases. While these skin conditions aren’t life threatening in the cases I have presented, they are often difficult to treat and unpleasant. Seek out a salon or spa that uses a heat autoclave to sterilize their instruments. You can ask directly if the instruments are autoclaved and they should be able to answer this question. Establishments that use autoclaves will often have their instruments in sealed bags. Other spas or salons will use an alcohol-based solution to clean their instruments, this can be helpful, but is inferior to heat autoclaving. Autoclaving entails placing instruments inside a machine utilizing intense pressure and high heat to destroy all organisms on tools. It is the gold standard for sterilizing even medical and surgical instruments. 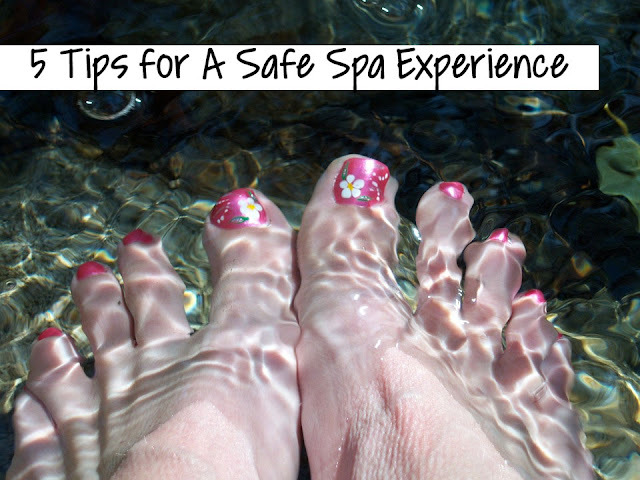 Don’t soak your feet in the foot-bath in the nail salon. Unless a disposable liner is being used for each customer, I cannot think of a dirtier place to soak your feet. As appealing as a nice warm soak might sound, I have seen some terrible infections that were picked up at nail salons. One such customer had suffered an amputation of one of her toes due to a salon-acquired infection. The issue is that you never know who is going to pick up an infection. The vast majority of people who have these services have no such serious complication, but very commonly will develop a wart or athletes foot. Bring your own nail filers/emery boards, and/or other nail tools if you desire. When in doubt, you cannot go wrong by being prepared and bringing in your own supplies. You may get a few looks by other customers, and cause the employees to talk a little, but is it worth it to have fewer worries about your health? Absolutely! It is not uncommon for many salon goers these days to come prepared with their own equipment. Do not permit the use of any reusable instruments that are not sterilized. For example: getting a massage and being scrubbed with a brush that is used on other customers. Do not be shy, and don’t let anyone use something that has not been properly sterilized. A nice way of avoiding this awkward moment is to actually be up front and direct with your question before having a service. Seek care quickly! If you do pick up what appears to be a wart, nail fungus, or another skin infection, do not delay seeking dermatological care. The earlier you start treatment, the easier it is to fully resolve. There are many treatment options available and your dermatologist can advise which one will work best. In addition, holding off treatment can result in the development of more warts and spreading warts or fungus to your loved ones at home.